Oooh, Shinies! : Bright, round glitters... love them! Bright, round glitters... love them! 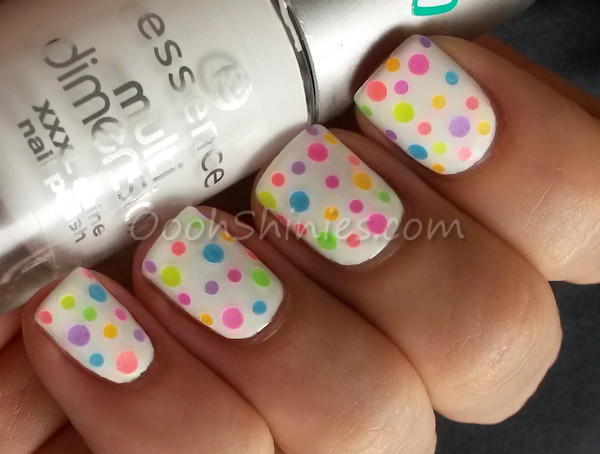 Essence Perfectly True with BPS round glitters. The colors are a little bit more accurate here, but that's as far as my camera can handle the brightness! Just imagine them (almost) neon :) The little pot is the same size as the pots that these hexagonal glitters from BPS come in, and I've applied these glitters the same way as well. They're also great if you struggle with dotting (like my left hand, haha! ), or when you don't have various bright colors to dot with. I tried to capture the colors on my nails a bit better, still not perfect, but this pic hopefully gives you a better idea! They come in orange, blue, purple, green, yellow, light pink, dark pink and coral pink. I really like this fun look ♥ The glitters did soften a little bit in color from the top coat, but they didn't bleed color, and I also preferred the softened look! I went for a simple white as basecolor, I'm sure these work great on other colors as well, but some colors are a little bit see-through (noticed it with the green and yellow). Not a problem at all, unless you want to use them to cover up a line between 2 colors. I started with a grey/white taped mani, and wanted to apply these over the line, but then you could see the grey come through a bit. If the whole nail would've been grey, I wouldn't have noticed it though. Anyway, that's just a very minor downside if you ask me, and I totally love these glitters! 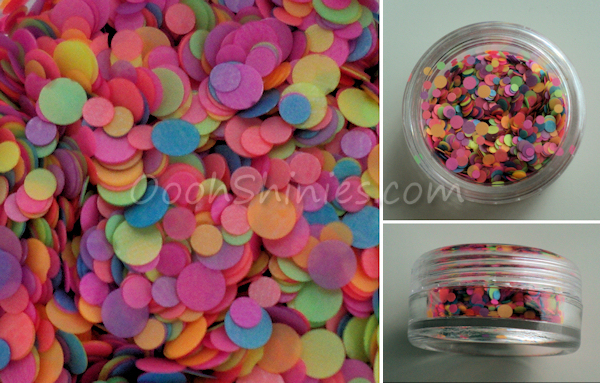 These glitters cost $3.71 for a jar and you can find them here on the BPS website. Don't forget to use code ABJ61 for 10% off! I'd love to hear what you think of this mani! :) Thanks for stopping by and have a great Sunday! Still not done with the kittens! Time for a kitten update!